The Live Vermont Election Coverage website from the Center for Media and Democracy mixed live-streaming with CoveritLive and other tools to make local election coverage more interactive. The Public Media 2.0 series on MediaShift is sponsored by American University’s Center for Social Media (CSM) through a grant from the Ford Foundation. 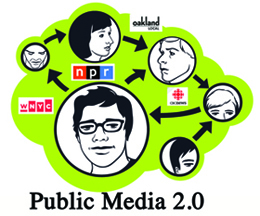 Learn more about CSM’s research on emerging public media trends and standards at futureofpublicmedia.net. Around the country, community media centers are launching exciting new collaborations with local organizations, neighborhood activists, schools, and media outlets to create online, hyperlocal citizen journalism sites. These projects are re-imagining how Public, Educational and Governmental (PEG) access TV stations — which are funded through regional negotiations with companies like Comcast — can serve their communities’ information needs in the digital age. Innovative experiments in community news production are replacing the tired old 'Wayne's World' stereotype of public access." These innovators are using digital and cable access technology to generate civic awareness and create diverse local media — a function that’s increasingly crucial as traditional journalism institutions face their greatest challenges to sustainability. These centers provide much more than public access to cable television, having fully embraced computer-based production and broadband technology to augment their media training programs. As a result, innovative experiments in community news production are replacing the tired old “Wayne’s World” stereotype of public access. This article spotlights five examples of how PEG access organizations are using funds tied to cable television as the bearing wall to support experiments in inclusive community news production. This project is greatly a result of social media and community coming together. We consider ourselves a host of the Rapidian and a welcomer. We created the platform in response to what people were asking for and looking for. We held a series of town hall meetings. We had meetings where we invited our commercial media folks to discuss how this could help with what they’re doing. Out of these meetings, GRCMC staff decided to develop four neighborhood news bureaus, but they realized that they needed to connect with the community physically before the neighborhood would buy into the community news platform online. The Rapidian and NeighborMedia at Cambridge Community Television (where I used to work) are two examples of citizen journalism projects that are leading the way in community news innovation. The good news is now other PEG access TV organizations in Philadelphia, Sacramento, and Reading and elsewhere, are launching their own neighborhood news initiatives. PEG access is often the best place on TV for residents to access local election coverage. Take the Center for Media and Democracy in Burlington, VT, which operates the city’s government access TV channel. The station has been at the forefront of innovative uses of cable access TV and the web. For example, earlier this year I wrote about how viewers can access on-demand “clickable meeting agendas” via the Center’s website. 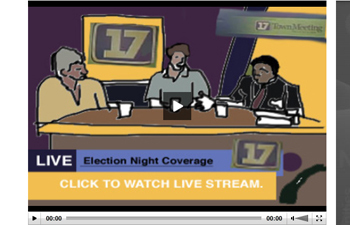 During this past election, Channel 17 created Live Vermont Election Coverage, a website where residents could livestream the results and interact via CoveritLive. The Center also posted videos featuring local voices from exit polls produced by community members. When combined with new online tools, community media centers can use their TV channels to make local content more accessible and more relevant to people’s everyday lives. The Bay Area Video Coalition) operates San Francisco’s Public Access TV station. Along with offering media production classes and youth media programs to Bay Area residents, BAVC has found new ways to bring cable access into the digital age. BAVC’s public access website at SF.commons.tv is powered by MIRO Community, a project of the Participatory Culture Foundation. This interactive video platform gives BAVC producers the ability to share their local media alongside any other video available online using embeddable RSS feeds. For example, SF.commons.tv has a San Francisco Bay Area channel featuring local news from KQED, a public media organization in Northern California. Local PEG Network assets are deployed and interconnected with wireless transmission networks that reach remote locations for broadcast radio, TV and Internet, and for mobile users’ broadband needs. This ‘digital ecology’ approach takes a long term view for the growth of communication networks both on the ground and overhead, engaging local resources with any media necessary to help meet comprehensive community needs and interests for public health and safety, for lifelong learning and for civic engagement. Access Humboldt is building on their broadband infrastructure through a partnership with the Internet Archive. The two organizations created the Community Media Collection to encourage public access centers to upload their community-produced content. Thousands of hours of local cable access programming from across the country can be viewed at archive.org. In an announcement about the project, PhillyCam partner Voice of Philadelphia said: “The effort, which will involve local youth affiliated with YESPhilly, will investigate why young men of color leave school. Aside from reporting, the project will allow VoP to engage in one of its other long-term goals – the training of citizen journalists.” Drop Zone builds on PEG access TV’s long-standing mission to ensure access to diverse voices in local communities. These innovative community news projects show the potential of PEG access TV stations to re-imagine themselves as community media centers in the digital age. However, all is not rosy for public access TV. TechFlash recently reported that SCAN TV in Seattle will shut its doors to the public at the end of the year. In the process, SCAN TV joins a long list of community media centers that have been negatively affected by an economy in crisis and by legislation that has shifted local control of media to the state over the past five years. These cutbacks are happening at a moment when community media centers are serving vital local needs. After all, it has been proven that many support what a recent report by Blair Levin calls “a sensible approach to broadband adoption” by providing the public with media and digital literacy training. Free Press and other public interest media organizations have called for an expanded public media system to provide funding and support for community news projects, which model an open and democratic form of Public Media 2.0. PubCamps across the country — such as the one this weekend — are beginning to set the stage for collaboration between public and community media. To thrive, the PEG access community desperately needs a broadband policy framework that supports such pioneering local media initiatives. Colin Rhinesmith is a doctoral student and Information in Society Fellow at the Graduate School of Library and Information Science at the University of Illinois at Urbana-Champaign and an Affiliate with the New America Foundation’s Media Policy Initiative.